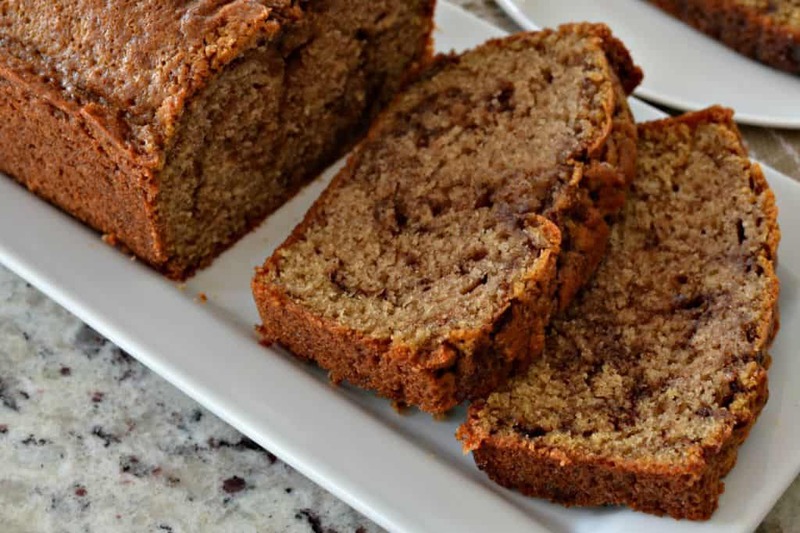 Cinnamon Bread is an easy sweet bread that comes together quickly and is swirled with sweet cinnamon butter. This moist loaf is perfect for breakfast, holiday brunch and even dessert. 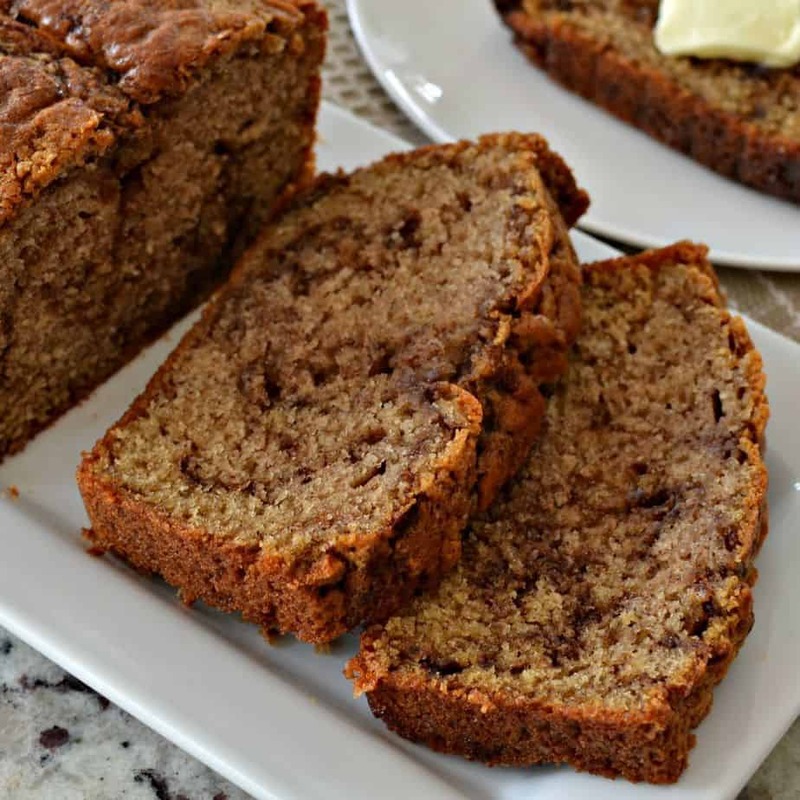 I have always loved cinnamon and this sweet bread is truly a cinnamon lovers dream. Prepare to be wowed. It takes about twenty-five minutes to prep this loaf and get it in the oven. Where does cinnamon come from and how does it grow. Most of the worlds cinnamon comes from Sri Lanka, off the southern tip of India. This delicious spice comes from the inner bark of several species of trees. The cinnamon sticks that you see in the store are this inner bark that has been cut into individual size sticks. Grinding the dried sticks to powder makes the spice easier to add to your recipes. How to make Cinnamon Bread. Start by whisking together flour, sugar, baking soda, baking powder, salt and cinnamon in a medium bowl. Then in a large bowl whisk together the milk, lemon juice, vegetable oil, vanilla and eggs. Add the dry ingredients to the wet ingredients in three parts stirring just to combine. In a microwave safe measuring cup or small bowl melt the butter. Add the brown sugar and cinnamon and stir to combine. Then pour half of the bread batter in a well greased loaf pan. Make three lines the length of the pan with the cinnamon butter. Now turn the pan horizontally and swirl with the end of a skewer or a toothpick. The best way to swirl is to make S or 8 shapes. Do not overdo it or everything will mix together. Add the rest of the batter and make three lines the length of the pan with the cinnamon butter. Now turn the pan horizontally and swirl with the end of skewer or toothpick. Place in the oven and bake. Finally allow the loaf to cool for five minutes and then invert. 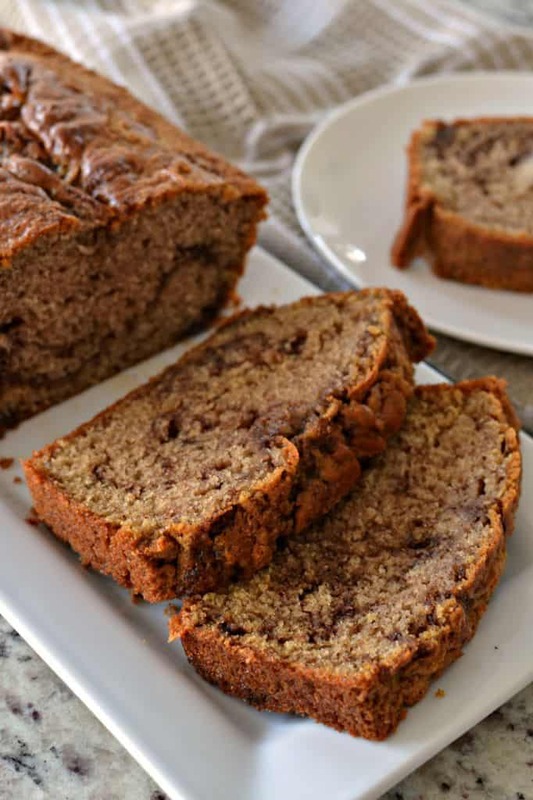 Can you freeze Cinnamon Bread? Yes you most certainly can. Cool the loaf completely before freezing. Double wrap the bread in freezer bags removing as much air as possible. You can also place the wrapped loaves in a sturdy glad-ware freezer container. When thawing place the loaf on the counter four to five hours before you plan to serve it. You can also freeze individual slices and pull them out as you want them several hours in advance. This bread is delectable lightly toasted with a pat or two of butter. So incredibly delicious! 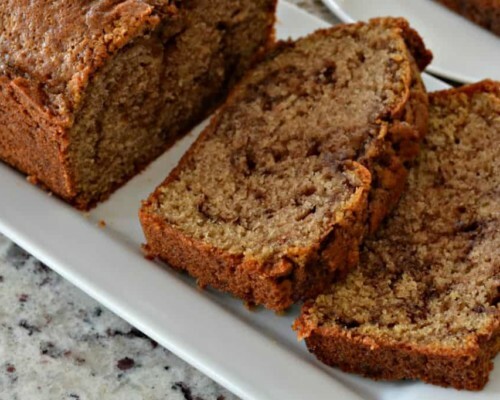 Helpful hints on making this Cinnamon Bread Recipe awesome. Use the freshest cinnamon you can get your hands on. If you love raisins add 1/2 cup when stirring in the flour. Stir the dough by hand and just until incorporated. Sweet bread dough can become tough if over-stirred. Don’t over swirl the cinnamon butter. You will not get super clean swirls but you will have streaks of the cinnamon butter throughout your bread. Let the loaf cool for just about 5 minutes before inverting. Sweet breads can stick if allowed to cool too long in the pan. Once cooled cover with wrap and store at room temperature for up to 3 days. Frozen will last 2-3 months when properly wrapped. Other sweet breads you will love! 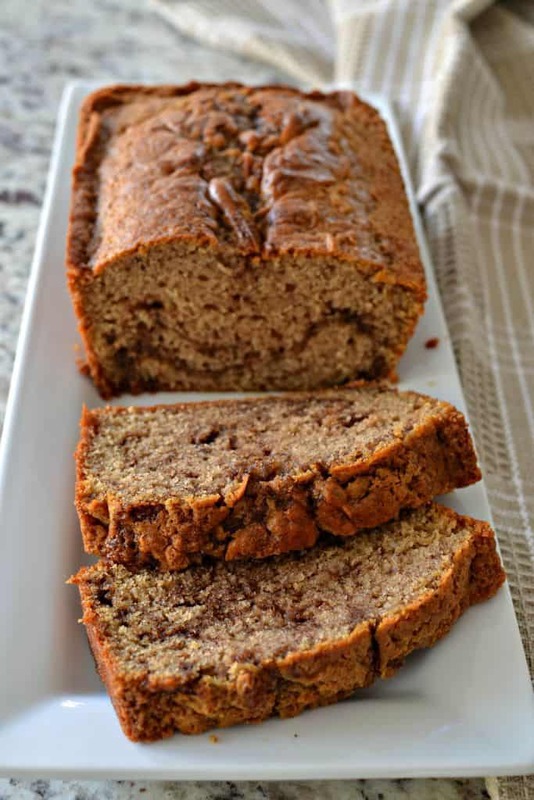 Cinnamon Bread is an easy sweet bread that comes together quickly and is swirled with sweet cinnamon butter making it perfect for breakfast or brunch. In a medium bowl whisk together flour, sugar, baking soda, baking powder, salt and 1 tablespoon cinnamon. In a large bowl whisk together the milk and lemon juice; let stand for 5 minutes. Add the vegetable oil, vanilla and eggs. Add the dry ingredients to the wet ingredients in 3 parts stirring just until incorporated. In small bowl stir together brown sugar, 1 1/2 tablespoons cinnamon and melted butter. Pour 1/2 of the batter in the loaf pan. Make 3 lines the length of the pan with the cinnamon butter. Now turn the pan horizontally and swirl with the end of a skewer or toothpick. The best way to swirl is to make S or 8 shapes. Do not overdo it or everything will mix together. Add the rest of the batter and make 3 lines the length of the pan with the cinnamon butter. Now turn the pan horizontally and swirl with the end of skewer or toothpick. Could this recipe be used for muffins? Yes it sure could be. I am unsure of the final count…probably around 12 muffins. With a cook time of about 25-30 minutes. Cinnamon and nutmeg are the spices that tops my list. They’re festive and it just gives out the flavors of the holidays. Since it’s almost that wonderful time of the year, I will be making your Cinnamon Bread recipe on Christmas Eve. I will also try to do your Apple Pecan Sweet Bread recipe because I like pecans a lot. I baked this last night and I am very glad that I was able to make it right the first try. I am new at baking so I try to make simple bread and pastry dishes first. Thanks for the recipe! This is the yummiest cinnamon bread I have ever had! Very easy to make, too. I added nutmeg & ginger, it was fabulous! Never even had a chance to get cold. That is so sweet Adrienne! I am so happy that you liked it!